There appears to be little regulation on the production of plastic items. Manufacturers seem to be able to produce as much as they can and of any product, recyclable or not, yet not be responsible for any problems we are all now learning this plastic waste is causing. Self regulation is the term used. The take up of additives to make plastics biodegradable is minimal as it adds extra cost for manufacturers. Some industry researchers even say the plastics industry fights tooth and nail on ANY policy which would reduce plastic consumption. The June 2011 case of a plastic bag ban bill (OR SB-536) in Oregon failing due to lobbying by plastic manufacturing pushing recycling of bags, is their preferred way to control plastic bag production. What was not so obvious is that a plastic bag has to have 70% new material in it to have sufficient strength. This means for every 1 recycled bag turned into more plastic bags, it needs 3.3 new bags to be manufactured. Those 3.3 bags when recycled then require 10 bags to be made and so on. How is that a solution to limiting plastic bag production? In Australia, a similar theme of self regulation can be seen. The federal government states “The Department of the Environment, Water, Heritage and the Arts is working cooperatively with the Plastics and Chemicals Industry Association (PACIA) and the Vinyl Council of Australia to identify and address priority environmental issues, particularly those related to resource use, reuse and recovery. The plastics industry is the second largest manufacturing sector by turnover and a substantial contributor to other sectors such as automotive and packaging.”PACIA states, “In 2000, plastics consumption was 1,530,783 tonnes with 167,673 tonnes recycled. The 2010 survey recorded consumption at 1,501,258 tonnes with 288,194 tonnes recycled – an increase of 120,521 tonnes, or 72%. Better design and light weighting appear to be contributing factors to a decline in consumption, while growth in recycling is attributed to coordinated improvements in consumer education, collection systems taking a wider range of plastic types from a growing number of locations, recycling investments and market development.” While the increase of 72% sounds impressive(and it is, as any increase is) beneficial, if the average over 10 years is calculated, it equates to a 5% increase in recycled plastic every year. (It is not hard to imagine in this day and age, they could be doing a lot better than that if they tried). For total recycling in 2010 the above equates to 19%. Where is the rest going? Perhaps a good part of it stays in service for many years, but eventually all the old plastic will get discarded as it gets replaced with new plastic. What if it was all made landfill biodegradable so that whenever it was thrown out to a landfill, it would then biodegrade away?The above shows the plastics industry is making a minor effort to make any difference to the waste side of the products they make. What about on the production side? Are manufacturers attempting to reduce plastic in favour of a more environmental friendly option?Take a walk down a grocery store isle and look around. Today if we want to make pancakes from a readymade mix, we have to buy the mix already premeasured out into a plastic bottle for one meal. 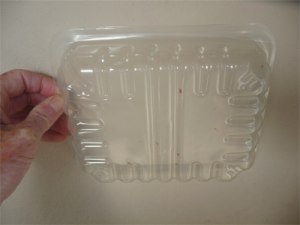 This means every time a family has pancakes they dispose of a plastic bottle. This meat pack tray does not even have a recycle number on it. So it has to go to the landfill for eons. Feel like a snack to hold you over for a few hours? This container holds over a few centuries. 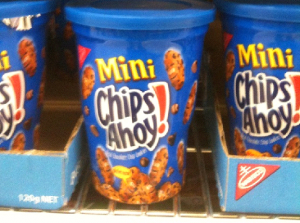 A snack of mini cookies comes in a container that lasts for 100’s of years.Baking flour always came in paper bags. Not anymore. 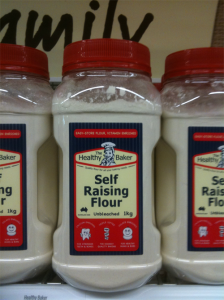 Baking flour always came in paper bags. Not anymore. Self Regulation of Product Designs by Manufacturers? Numerous packaging products of today were designed with no thought of what happens to them after they become plastic waste. 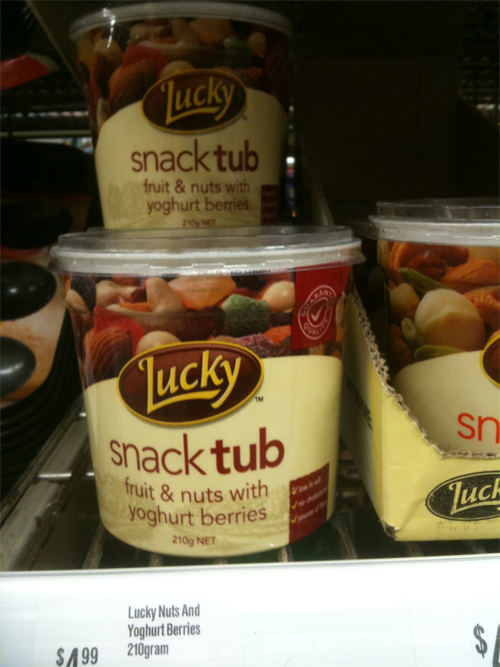 The infamous 6 pack plastic ring of the 70s that killed scores of wildlife is now thankfully mostly a thing of the past. This is due to the pressure put on the manufacturers to develop an alternate less lethal method. A few persistent manufacturers still want to use them however. WHY? A common example today of a poorly designed manufacturer’s product is the simple ring under the screw on cap of a plastic bottle. The ring serves the purpose of showing the lid has not been tampered with. These rings are found on most drink bottles and the larger 2 and 3 litre juice bottles. The issue with these rings is that they come off bottles and become ensnared on wildlife. One of the more popular images of this is the mature turtle who grew in a figure 8 with a constricting plastic ring around its middle. On one juice bottle alone there can be three rings that can be hazardous. There is a security ring, a lifting ring and a ring to hold the lifting ring on to the bottle neck. 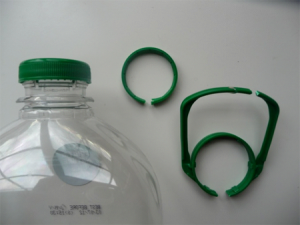 A little forethought by the manufacturer could eliminate all these rings off a bottle and make it safe for the environment without compromising the intent of the security of the cap. It therefore seems manufacturers still have a long way to go before product materials and designs for life are considered rather than designs for short term use only are considered. Designs for life factor in the consequences of what happens after disposal.